I am so excited that I got a new brand to review. It is Sarah Borghi, an Italian brand that specialises in making hosiery for more than 40 years. Most of their point of sale however, are in Italy, which explains why I have never heard about the brand. The item we will be looking at is Elisa tights, one from the Spring/Summer 17 Collection. I bought it from Ludwig Beck Department Store in Munich*. ⊕ Beautiful intricate lace design. ⊕ Feel more like cotton than nylon. ⊗ Very small toe section. ⊗ Very brief product description. ⊗ The thread at crotch can hinder side movements. The item is placed in a tri-fold cardboard, which is then wrapped in a transparent plastic sleeve. Although there was no thin cardboard to hold the tights in place, it did not slide off the grid when I move the package around. The round hole at the rear centre of the packaging allows you to glimpse the colour and pattern of the tights. There is no product description online, and the description on the back of the packaging is brief: “Fashion net tights with Lycra”. I do find this a bit of a shame. This is because the tights has some great features and there are plenty of space on the packaging to show. Sarah Borghi Elisa back cover. The Elisa are open-knit tights in matte fashion. The main feature is the optic lace pattern which runs from waist to toe. 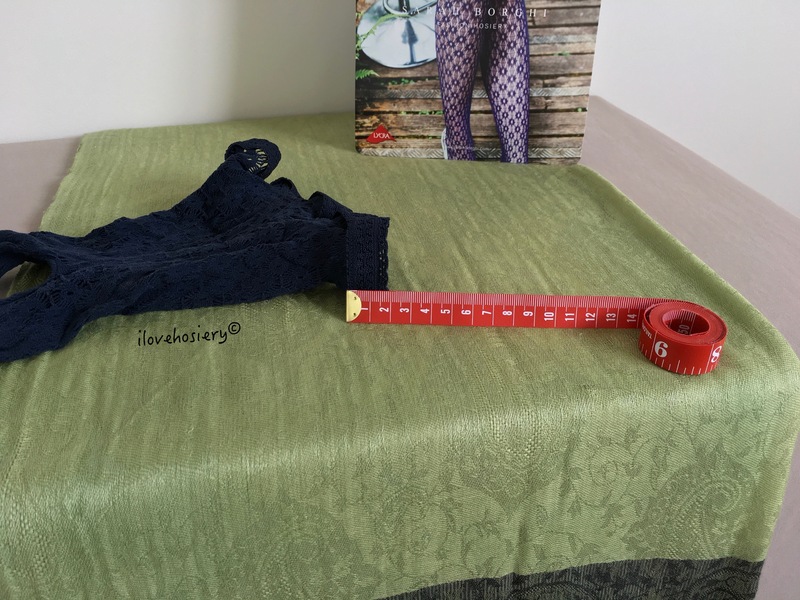 The lace waistband measures 2cm wide. There is no gusset, and the crotch is sealed with a thread. The toe section is reinforced but not the heel. The composition is 87% polyamide and 13% elastane. Sarah Borghi Elisa Promotional Image. 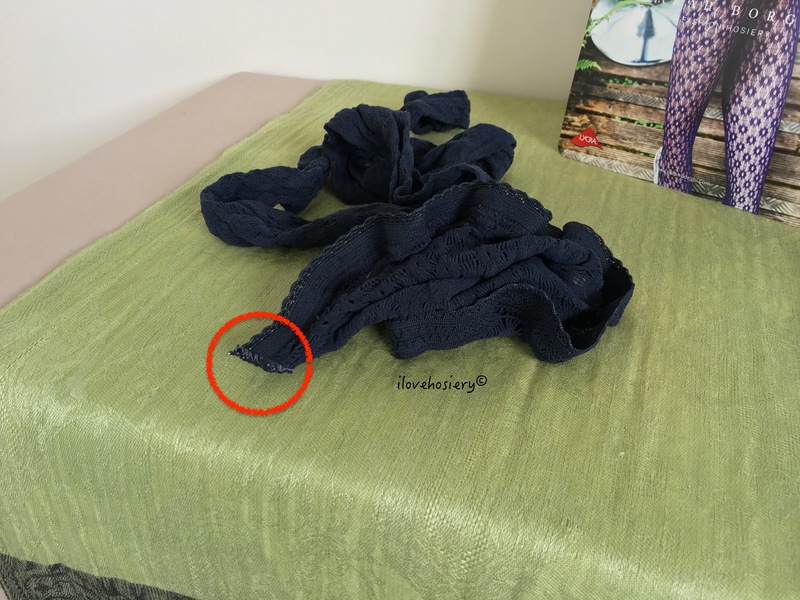 The stitches that binds the waistband. There are two sizes available for Elisa, which are clearly shown on the back of the packaging (see below). I bought both sizes, one for my partner and one for myself. I used size L/XL for this review. Sarah Borghi Elisa size chart. To my knowledge, these are available in blue and black colour. I used Blue for this review. I had a very good fit. The tights hugged the legs very well. For this reason, I am somewhat skeptical about the size being able to fit up to 190cm tall. As expected, the reinforced toe section was so small that I couldn’t fit all my toes in. Fully stretching the section only cramped my toes further, so I had to leave some of my toes uncovered as a result. The thread at the crotch runs from one side to the other. Thus it limits your mobility to stretch your legs sideways. It should not be a big problem unless you want to do a crab dance with it. The waistband was comfortable by the way. The appearance was very attractive indeed. The lace pattern looks like blinking eyes as each one expands and contracts with each step. These round “eyes” are interconnected with spider leg-like lines. For me, it look more distant and robot-like, than a warm, feminine feel. I know a reinforced heel here would kill the overall appearance. But this is the place I see as being the most vulnerable. If you want to match the tights with boots or sneakers, I would suggest wear a pair of invisible socks to make them last longer. Since the toe section is relatively small, you can have it encompassing or under the toes. The first option give the tights a better durability, whereas the second has a better look. For me, the toe section tend to slide under the toes, perhaps due to the way I walk. I really like feeling of the texture. It was relatively soft and smooth; more like cotton than synthetic fibre. Being open-knit tights, it also has very good breathability. I was a little concerned about the stitch that binds the waistband together. It turned out to be insignificant, as I didn’t feel any uncomfortableness. Still, it looks a bid odd though. The thread at the crotch. I alway have mixed feelings when trying out new brands. On one hand it is very exciting. On the other hand, you don’t know if you are stepping onto a mine. 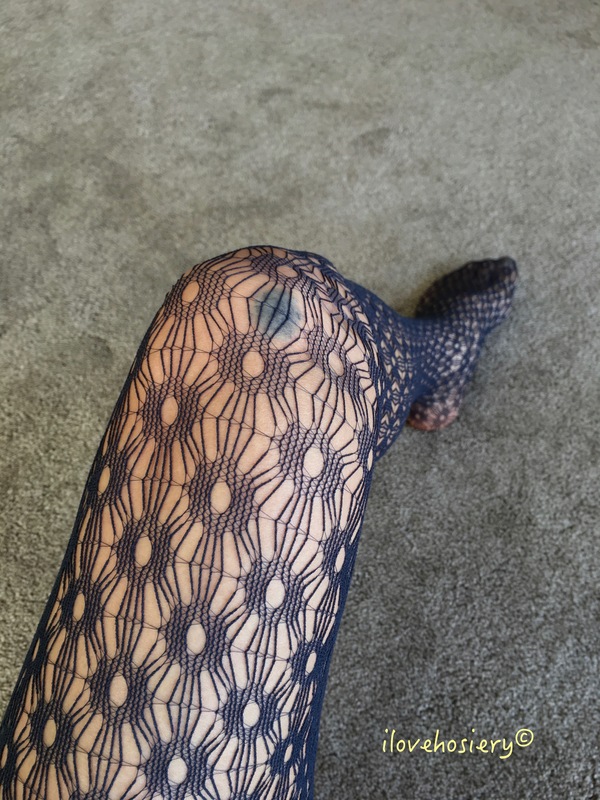 The Elisa tights from Sarah Borghi turned out to be on the good side. There was an issue with lack of information but the tight per se is attractive. I bought the tights for €19.90. Since they are from previous season, you could get a reduction. The Ludwig Beck Department Store in Munich has a huge space (two floors) designated for hosiery. They stock many, many brands, in various styles. It is a must-visit destination if you are a hosiery lover.